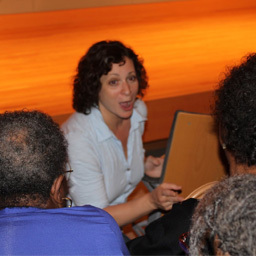 Always involved in the making and performing of theatre, EVE SILBER has maintained her connection to its power as a teacher of theatre workshops to non-actors. EVE SILBER is a highly experienced educator in the field of theatre-in-education, applying theatre as a tool for non-actors to explore vital social/health issues and evolve life skills. Having studied with Augusto Boal (Legislative Theatre, Theatre of the Oppressed), her expertise lies in linking the perpetual human capacity to learn with engaging and activating educational processes. She has worked as a teacher, director, and curriculum developer for programs throughout New York City serving diverse populations in schools, shelters, rehab centers and corporate settings. Facilitating inter-active, theatre based workshops she has worked extensively on the subjects of HIV prevention, conflict resolution, time-management and job-readiness. She received her M.A. in Educational Theatre from NYU and her B.S. in Performance Studies from Northwestern University. A play written by ladies from the Morris Senior Center (Bronx, NY), presented at the NYC Public Library on 5th Avenue to the NYC DOT commisioner. "A visit to one of Eve Silber's workshops a few years ago was my first up-close exposure to educational theatre in action. Eve had been working with a class of 8th graders in Queens and she hired me to coach the students in the final stages of rehearsal for the performance of their original play. I found the experience extraordinary. Through improvisation and playwriting exercises the class had written a play. Each student had had a part in writing and was featured in one or more of the scenes. The atmosphere of the classroom was remarkably similar to some of the best professional theatre experiences I have had. Eve, as facilitator and director, had clearly unleashed a great deal of dramatic capacity in every one of these students, -- without exception. Eve explained to me that her goal was to create an experience for the students where they actively used theatre as a language with which to explore their world. These students were a focused ensemble with a common creative goal under Eve's expert guidance and direction. They were delighting in their task and pleased with their product. For me, it was a stunning display of what had drawn me to the theatre in the first place." "This was great emotional, psychological and tactical training for activist work on the streets, be it participating in demonstrations or working with small groups. Shy people, like me, can get some help being more comfortable with the dynamics of empowerment." "This workshop was not only fun but extremely edifying and useful. The exercises fostered community and creativity, challenging me to be aware of how I communicate and how I react to others, as well. Eve did a great job of facilitating, encouraging and challenging us to explore new ways of expressing ourselves creatively as we continue to build the movement. I left feeling nourished both mentally and physically and inspired to move forward and apply the things I'd learned." "I was quite impressed by how well a group of people can gather to work for a common cause without boring meetings and endless discussions." "Participating in the workshop helped me clarify my feelings about my activism, what holds me back and what empowers me. It provided a sense of comfort that other activists experience these conflicts as well. Eve is insightful and sensitive and I had fun." "I didn't know much at all about Theatre of the Oppressed walking in but left with not only an appreciation for such a holistic form of organizing but that much more respect for Eve Silber's rock star capacity for creative activism!" "Theatre of the Oppressed reveals blind spots. I come from faith based activism so the "cop in the head' from TO revealed my own "Bishop in the Head". Now that I know that is present for me, I can act with more clarity." "Eve's workshop is highly recommended: As a doctoral student of Applied Theatre at NYU and Licensed Drama Therapist, I can attest to Eve's ability to meet group needs with highly relevant activities facilitated with panache and aplomb. Part of the success I witnessed was based on Eve building upon what occurred previously. New members were easily brought up to speed, nevertheless, cultivating a community and culture of with a shared arts-based language will go very far to generate the personal and societal changes we each want to implement. Boal's powerful work is also notoriously misunderstood and misapplied. However, Eve's facilitation underscored her fluency and deep sensitivity for the nuances of TO work"
"Eve Silber delivers Boal's Theatre of the Oppressed group work with presence and clarity. Drawing on her own intense experiences, she seems able to relate to any one's situation, however big or small, and invite others to relate to their experiences in a way that brings the whole group into a deeper awareness of its self. By opening up and sharing our imagination and experiences. especially in relationship to power and interpersonal dynamics we find we can create our own power. As collective witness and through replaying the events in our lives, we prepare us for doing it better next time. Eve is flexible and responsible to the max, with that amazing fresh balance of play and precision." "The canonical Theatre of the Oppressed is a living breathing awareness theatre! The workshop I attended at Judson, taught by master joker (facilitator) Eve Silber, shone light on an art form gifting tactics for continuous change. Everyone is encouraged to be the joker. Energy there was contagious, no moths circling around light bulbs, instead an intelligence that is urged to artfully operate open heart surgery in public. Lines in the sand, be the general surgeon."